The next time you design a WordPress theme think about using TypeRocket for your theme options. TypeRocket works as a theme options framework for WordPress by providing the custom fields you need to customize your themes completely. To get started all you need to do is enable the theme-options plugin in the TypeRocket configuration. Theme options are commonly used to manage the global elements of a WordPress theme's design. These elements could be as simple as the copy right information at the bottom of every page; to API keys for Google Maps or Facebook Sharing. You can use any of the fields that come with the forms api. This means you can have 18+ types of fields. Out of the box the theme options plugin comes with a file called admin.php. Place the new file in the root of you custom theme's directory. Rename the new file to theme-options.php. 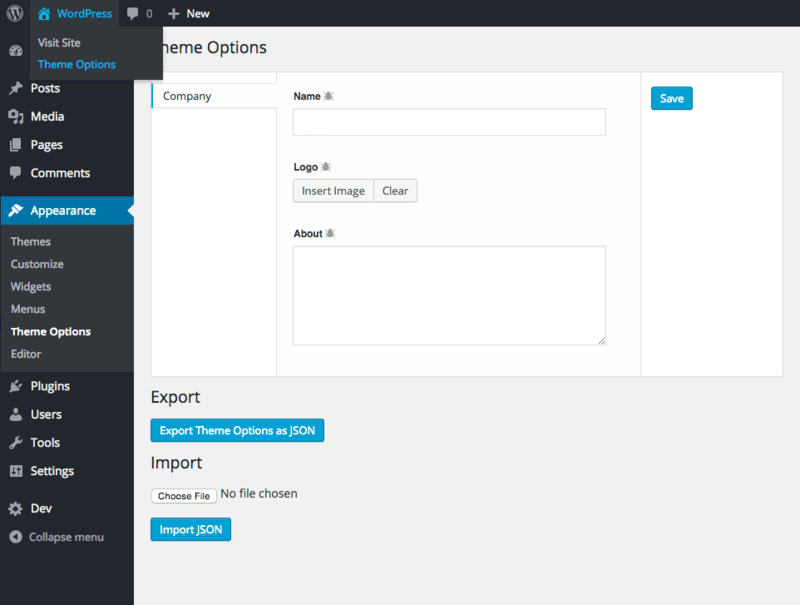 Next you need to let the theme options plugin know that you are going to use theme-options.php as the new admin page. In your theme's functions.php file add a filter for tr_theme_options_page. This will replace admin.php with theme-options.php. To wrap up configuration, change the theme options name with the filter tr_theme_options_name. This will make sure you don't run into conflicts with other themes and save your options to the custom name in the wp_options table. Now, lets start with the bare minimum. Use the code below as the contents of the theme-options.php file. If you have debug mode enabled you will see the export/import feature at the bottom of the page. When debug mode is turned off the code hints and export/import will be removed. With debug mode enabled you can simply copy the code hints into any theme template file. Finally, you can get the basic field types into the templates: Text, Image and Textarea. For a text fields a using echo will work just fine. However, don't forget to sanitize all user entered data on output. The image attachment ID is saved for image fields. Using a function like wp_get_attachment_image() will get the <img /> tag. For a textarea you can use nl2br() or wpautop(). Because wpautop() adds <p> tags over <br> tags in most cases you should use that. If you decide to use advanced fields like repeaters and galleries you can use var_dump() to inspect the fields. We are not going to cover using these types of fields here but if you know a little PHP it will make since. Now that you have the most basic setup you can start adding more tabs and fields.